The potential effects of climate change threaten agricultural systems across the globe, including subsistence agriculture and valuable export crops such as cocoa and coffee. By 2050, a rise of 2.3 degrees Celsius will drastically affect production in lowland regions, including the major cocoa-producing areas of Moyen-Comoe, Sud-Comoe, and Agneby in Côte d’Ivoire and Western and Brong Ahafo in Ghana. Farmers in these areas are particularly vulnerable since cocoa production is often their primary source of income. Climate change could transform the cherished chocolate bar into a luxury few can afford. More than half of the world’s chocolate comes from the cocoa plantations of Ghana and Côte d’Ivoire, where hundreds of thousands of smallholder farmers supply lucrative Fair Trade markets in developed countries. CIAT research reveals that an expected annual temperature rise of more than two degrees Celsius by 2050 will leave many of West Africa’s cocoa-producing areas too hot for chocolate. In 2013, CIAT-CCAFS published a report titled “Predicting the future climatic suitability for cocoa farming of the world’s leading producer countries, Ghana and Côte d’Ivoire,” cited 36 times according to Google Scholar. The report – the first of its kind to present future climate scenarios for the main cocoa-growing regions and the likely effects of climate change on cocoa production in the region ‒ anticipates that areas of cocoa suitability will begin to decline as soon as 2030 as average temperatures increase by one degree Celsius. 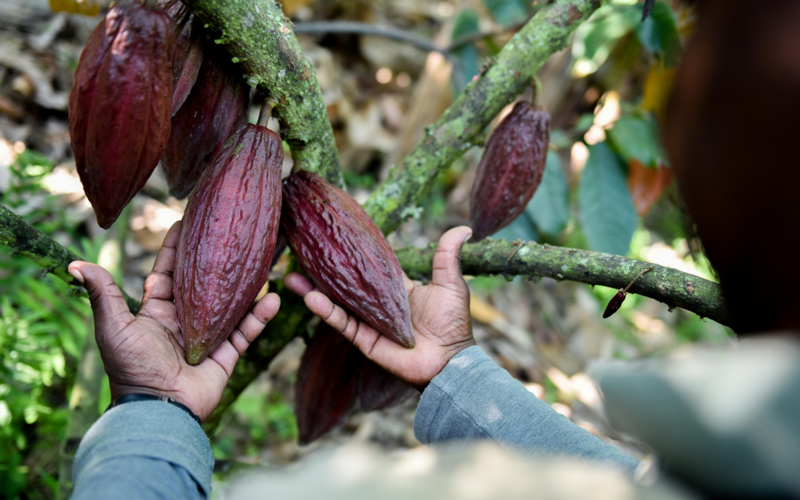 Warmer conditions mean the heat-sensitive cocoa trees will struggle to obtain enough water during the growing season, thus curtailing the development of cocoa pods containing the prized cocoa bean – the key ingredient in chocolate production. The trees are also expected to struggle as the region’s dry season becomes increasingly intense. In 2016, a Harvard Business School investigation cited CIAT’s report as a critical influence and “major wake-up call” for Barry Callebaut, one of the four major chocolate manufacturers in the world. In its 2014/2015 sustainability report, Barry Callebaut outlined two main fronts in its plan to address climate change: (1) mitigation: reduce the company’s greenhouse gas emissions by consuming less energy and switching from fossil fuels to renewable energies, such as biomass; and (2) adaptation: work with farmers to adapt to climate change. Encourage the planting of shade trees, such as timber trees that can also serve as a buffer crop; and develop and propagate heat-resistant forms of cocoa.